Can the A's survive California's stadium drought? 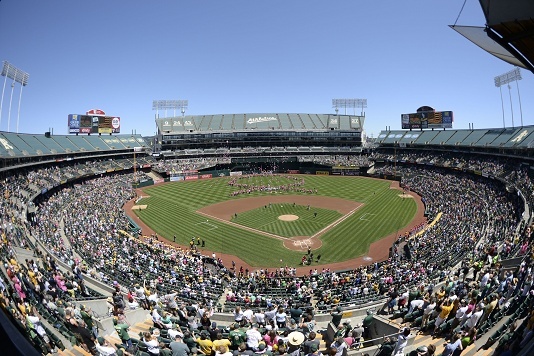 Can the A’s survive California’s stadium drought? As of June 2014, the state of California is awash in pro sports riches. The Golden State has 3 NFL teams, 5 MLB clubs, 4 NBA franchises, and 3 NHL teams. California also has 3 MLS franchises, 2 AAA baseball clubs, and its own Single-A minor baseball league. Everywhere in the state that is well populated is well serviced, with only the sparsely-populated “Upstate” area near the Oregon border lacking teams. All of the major pro teams that call California home came about in the wake of the state’s immense post-WWII growth. With few lapses, the state’s population and economy have continued to grow, making its GDP large enough to be the 9th largest world economy if it… you get the idea. California’s big and important. It’s self-evident. What’s less evident at first glance is that there’s a huge problem in California when it comes to pro sports. For numerous reasons, California has an exceedingly difficult time getting new facilities built for its major teams. Since 1999-2000, when Staples Center and AT&T Park opened in Los Angeles and San Francisco respectively, exactly one new stadium and zero arenas have been constructed. That streak will finally come to an end this fall, when Levi’s Stadium opens in Santa Clara for the 49ers. In 2-3 years the Sacramento Kings will have their new downtown arena. Yet several teams remain stuck in subpar facilities, and for most of them the outlook is not good. The situation is most dire in Oakland, which has the only shared-stadium setup in America. The Oakland Athletics have suffered the most, starting in 1995 when the Raiders came back home from their brief stay in LA. The Coliseum, which was originally built to hold about 50,000, received a major outfield renovation that added 13,000 seats, 90 suites, and a club level. The addition, later nicknamed “Mount Davis” in honor of Raiders owner Al Davis, blocked views of the Oakland hills to the east, towering over the original structure. From overhead the view was even worse, since the taller east stand gave the whole stadium the appearance of a toilet bowl. Couple that with the various leaks and sewage-related problems the Coliseum has suffered over the years and the stadium has since become a running joke. It’s slightly better for football, though the recent tarping of the upper deck has made it clear that the mid-90’s renovation, while well-intended, has only become a costly debacle of the highest order. In San Diego, the Padres left Qualcomm Stadium for a shiny new downtown ballpark, leaving the Chargers all to themselves. Here’s another case where the stadium was built too large (for a Super Bowl expansion) and sightlines are poor. TV blackouts are frequent because of the too-large capacity. The Chargers and Raiders both exist as potential LA relocation threats, but won’t pull the trigger (yet). To be fair, there are several teams that don’t need help. Staples Center houses the Lakers, Clippers, and LA Kings with aplomb. AT&T Park and Petco Park are both jewels. Dodger Stadium still looks immaculate at 52 years old thanks to ongoing improvements. Angel Stadium was upgraded in 1998, though team ownership is threatening to leave if it doesn’t get the land grab it wants. The arenas for the Sharks and Ducks are at midlife and are more than serviceable. Even so, the clock is ticking for most of these teams. Most modern venues are built to last 30-40 years before a new one is required, so it’s only a matter of time for most of them. The City of Oakland is in a temporary state of paralysis as it goes through an election cycle. Competing plans for an A’s ballpark are being touted as equally good, though both have significant procedural and/or financial concerns. A’s ownership has stayed steadfast about its desire to move the team to San Jose, but the Giants’ hold over that territory has stymied the A’s at every turn. Established LA fanbases make Raiders and Chargers are considered frontrunners for a move to Hollywood. At the same time, both Oakland and San Diego have been plagued with bureaucratic ineptitude or brazen corruption, enough to cast doubts on any plans to build within either city’s boundaries. In some ways California is a victim of its own successes. Staples Center and AT&T Park were both built with private financing, setting examples that would be difficult to replicate. The Warriors aim to build in San Francisco without any help from the city except for permits and planning approvals. Any new NFL stadium in LA probably won’t have public money from LA. The downtown LA football stadium concept has for all intents and purposes died. A’s ownership has long concluded that private financing is the only way to go, and already has a small example of the model in its new stadium for the San Jose Earthquakes. Yet there have been recent examples of public funding for stadia coming through. The City of Santa Clara committed $150 million to the 49ers and created a quasi-governmental agency to handle the loans for the rest. Sacramento is committing $250 million for a basketball arena. Unlike many other states that can devote funding to one of few teams they host (NJ, MN) or states that have carved out broad funding programs for facilities (AZ, FL, PA), California has long resisted state handouts to stadiums and arenas. That leaves any public funding to cities and/or counties to shoulder, which has netted mixed results. The only substantive help California can provide is legislation to streamline or bypass CEQA, the package of environmental regulations that govern all major new construction projects. Regulatory help is a far cry from cold hard cash. As long as that most previous resource remains scarce in the Golden State, the teams without large, wealthy fanbases will continue to have trouble putting together their own stadium deals. At least the weather’s nice.